Don (also known as Don – The Chase Begins Again) is a 2006 Indian action-thriller film directed by Farhan Akhtar. The film was produced by Ritesh Sidhwani and Akhtar's production company Excel Entertainment. The film stars Shah Rukh Khan and Priyanka Chopra, with Arjun Rampal, Boman Irani, Isha Koppikar, and Om Puri appearing in supporting roles. Don is a remake of the 1978 film of the same name, and follows the titular criminal's look-alike who has been sent on a clandestine mission to impersonate Don after he is wounded in a chase, and to infiltrate the plans of the drug mafia. The film was released on 20 October 2006, coinciding with the Diwali festive season. The film was generally well received by film critics, with praise directed towards Chopra's performance, action sequences, music, production design and cinematography. A major commercial success, Don grossed over ₹1.06 billion at the box office against a budget of ₹380 million and was the fifth highest-grossing Indian film of 2006. The illegal drug trade based in Kuala Lumpur is booming. A team headed by Deputy Commissioner of Police De Silva (Boman Irani) is sent to the city to target the operations of Singhania (Rajesh Khattar) and capture his manager, "Don" (Shah Rukh Khan). Singhania is one of the two lieutenants of a deceased kingpin; the other is Vardhan, whose whereabouts are unknown. After Ramesh (Diwakar Pundir), one of Don's close associates, decides to leave the gang, Don kills him. Later, Ramesh's fiancée Kamini (Kareena Kapoor) decides to help the police, but she is also killed. Planning to avenge her brother and his fiancée, Roma (Priyanka Chopra) infiltrates Don's gang. Don is injured and falls into a coma while trying to flee from the police. De Silva finds a look-alike named Vijay (Shah Rukh Khan) and asks him to join his mission so the police can get close to Singhania. Vijay agrees when De Silva promises to admit Deepu (Tanay Chheda), a boy Vijay looks after, to a school in Kuala Lumpur. Meanwhile, Jasjit (Arjun Rampal), Deepu's father, just released from prison, plans to kill De Silva to avenge his own wife's death. Vijay is admitted to hospital, where Dr. Ashok Gilwani gives him scars identical to Don's. When Don suddenly dies, the masquerade begins. 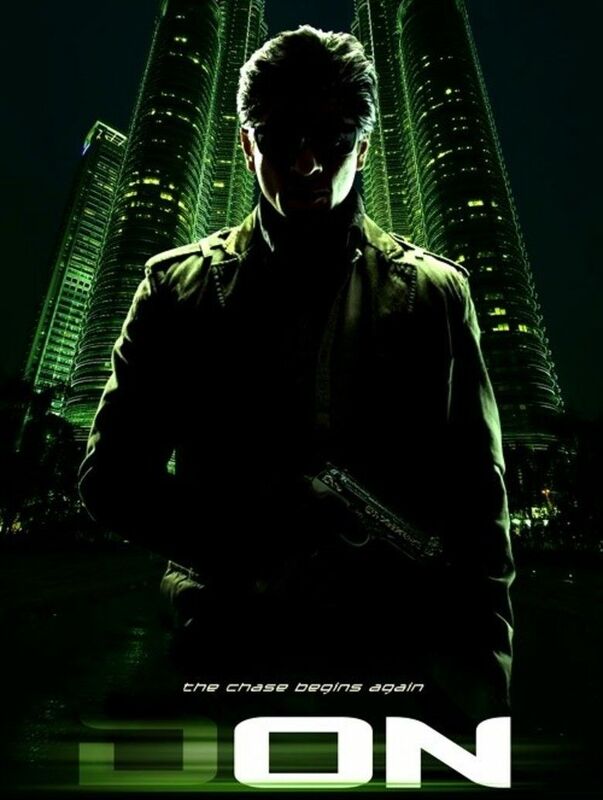 Vijay, as Don, joins the gang in Kuala Lumpur. De Silva asks Vijay to find a computer disc containing details about the cartel and bring it to him. When Vijay finds it, Roma attempts to kill him, but De Silva tells her about his plan, and she agrees to help him. Vijay hands over the disc to De Silva. When De Silva murders Singhania, the police arrive and arrest Vijay. De Silva is killed in the shoot-out, which is unfortunate for Vijay because De Silva was the only person who could prove that he is not the real Don. Having discovered his true identity, Don's associates turn against Vijay and the group engage in a fight. Don escapes and reconciles with Roma to recover the disc and prove his innocence. Meanwhile, Jasjit enters De Silva's apartment to wait for him and finds the disc. He receives a phone call saying that if he wants to see his son again, he will have to bring the disc to the men who are holding Deepu hostage. When he meets them, he learns that De Silva has been alive all along and is actually Vardhan, who was using Vijay to get close to his competitor. Later, Jasjit engage in a combat with Vijay but Deepu interrupts him, telling him about Vijay, who has been his guardian in Jasjit's absence. Jasjit teams up with Vijay and Roma and shares information about Vardhan's real identity. They come up with a plan. Jasjit arranges a meeting with Vardhan, but the trio have informed the Interpol. In a combat, Vijay overpowers Vardhan and is about to kill him but is interrupted by Inspector Vishal Malik (Om Puri), who pleads with him to leave Vardhan, who is later arrested. Vijay is acquitted, and Roma confesses her love for Vijay when is about to be taken to the hospital. After Vijay calls Roma a "Junglee Billi" ("Wildcat") and the van takes Vijay away, a baffled Roma realise that he is actually Don as he had given her that nickname and informs Malik. It is revealed that the real Don was alive, and was pretending to be Vijay the whole time. While in the hospital, Don had recovered quickly from his injuries, and had overheard Vardhan/De Silva's conversation with Vijay. After Vijay's operation, Don had gotten up from the room at a moment when Vardhan and Dr. Ashok were absent and gone to the room where Vijay lay. He had switched places with Vijay and taken Vijay off life support, causing him to die. It is also revealed that the disc Don had given to the police was fake. Now, with both Vardhan and Singhania removed from his path, Don becomes the master of the entire Asian drug dealing ring. Don reconnects with Anita (Isha Koppikar) at the airport and says half of his popular dialogue, "Don Ko Pakadna Mushkil Hi Nahi...." as the screen cuts to black. In July 2005 Priyanka Chopra was cast to play Roma, a role originally played by Zeenat Aman. Akhtar found Chopra to be perfect for the role, saying, "There is a docile sensuality about her which suits the character". When he offered the role to her, she was excited to play the character and immediately agreed to do the film. Later that month Arjun Rampal and Isha Koppikar joined the cast. While Rampal was cast as Jasjit, played by Pran in the original, after Akshay Kumar turned down the role for being secondary, Kopikar was cast in a completely new role that was not in the original film. In August 2005 Kareena Kapoor was confirmed to appear in the song "Yeh Mera Dil", which had been performed by Helen in the original film. In December 2005 UTV acquired the overseas rights of the film. Made on a budget of ₹380 million, Don was released worldwide on 20 October 2006 in 800 screens during the Diwali festive season, clashing with another high-profile Bollywood film Jaan-E-Mann. The film opened to excellent to very good response at the domestic box office, with an occupancy of 90 percent. After a first day opening of ₹46 million, the film grossed ₹141 million on its opening weekend. It also received a good opening in overseas markets with an opening weekend of over $2.2 million. On its opening weekend, the film grossed over ₹302 million worldwide. After its first week, the film took in more than ₹244 million in India. The film grossed $1.1 million in its first week in UK, while the total overseas first week earnings were more than $4.1 million. The film grossed ₹529 million worldwide at the end of first week. The film had a very good hold in its second week, and performed extremely well, even better than that week's new release and collections increased in several centres, with setting new second week highs. After its theatrical run, the film grossed over ₹7100 million in India, becoming the fifth highest-grossing Indian film of 2006, and was deemed a "hit". It also grossed over $7.8 million in the overseas territories and was declared a blockbuster. Worldwide, the film grossed over ₹1.06 billion (US$17 million) and was a major commercial success. Upon release, Don was generally well received by critics. Mayank Shekhar from Mumbai Mirror gave the film a rating of 4 out of 5 and wrote, "The former was a character-driven, intimate film, albeit a fairly slick thriller, mostly for its screenplay. The latter is a most updated Indian film of the action genre that always calculably concentrates on the new twists, and the turning points, both of which mostly seem cleverer than contrived; ably fitting pieces, the known characters, into a new domino." Raja Sen of Rediff.com gave a mixed review, saying that the film was "conventional and predictable", and complained that the director did not develop his characters. However, Sen was impressed by Chopra's performance, calling it "film's biggest surprise", and wrote, "Stepping into Zeenat Aman's shoes is a tough task, but she doesn't really waste time pretending to be the stunner's successor. Chopra handles her role with efficiency, looking every bit the competent woman of action – and a ravishing babe who fills out a skintight white jumpsuit deliciously. Roma is a hard part to play, but Priyanka has a no-nonsense air about her throughout the film. This is an actress willing to push herself, and has definite potential for screen magic. Not to mention a great smile." Planet Bollywood gave a rating of a 7 out of 10, particularly praising the twist ending, and wrote, "The Don of the 21st century is stylish with flaws, yet, you do enjoy the experience of watching it in the cinema." While labelling the film a "disappointment", film critic Sukanya Verma questioned Akhtar's decision behind remaking such an important film. She further criticised Akhtar for taking a fairly simple but engaging storyline, strangling it mercilessly, and turning it into a shockingly unimaginative adaptation. Verma also found Khan to be inconsistent in the dual roles; however, she praised Chopra's portrayal of Roma, and wrote, "The seriousness with which Priyanka Chopra plays Roma is rather notable. She is a picture of restrained toughness and bubbling seduction." Giving a 1 out of 5, film critic Rajeev Masand panned the film, terming it an exercise in indulgence, and wrote, "Spiffily shot and stylishly packaged, the new Don may wear a new look, but what it's clearly lacking is the raw energy, the unpredictability of Chandra Barot's original thriller."